washington fly fishing: Summer's End, and a new beginning. Summer's End, and a new beginning. Another fat sea run Cutthroat in bright shallow water. The end of summer is upon us, and I am rarely prepared for it; Shorter days and longer nights, a cooling trend, and just a little rain last week. Enough rain to tweak the rivers back into life. And as is typical of these Olympic Peninsula rivers, the response in flows was immediate. After months of low water, and with only a little misting rain on a day here and there since July, we got a solid day or so of some real rain. This is just what our Coastal Cutthroat trout and summer steelhead and salmon needed to stimulate better conditions, renewed foraging opportunities, cooler and more oxygenated water, and river flows to ride home on. Just as quickly as the rivers came up, they dropped back toward summertime flows again. But with that event, everything has changed. Even brief spates such as this one will help to move the salmon and steelhead that are migrating through saltwater on their way back to their natal streams. And for cutthroat and summer steelhead fishing, the freshet will stir resting fish into movement. The "October Caddis" hatches should be excellent ahead. Andy Hill has been catching fish all week! 9/14/13 Update: We have been enduring more beautiful summer weather around here. The rain and wind that passed through here last week brought a huge lightning storm across Western Washington and, in some places, a lot of rain. Out here on the Olympic Peninsula we were spared any serious impacts from heavy rainfall or storms as everything drifted south or north of us. The rivers never came up here. And even in lower river flow rates the summer run Steelhead and Sea Run Coastal Cutthroat trout dry fly fishing is superb here now. The beaches are fishing very well, for Coho and Sea Run Cutthroat. We will be fishing the saltwater beaches here through October at least. Some years we get decent saltwater fishing conditions through November. The week ahead is looking wet, as cool wet air is moving up from the southwest. Forecast: We expect rain off and on from Sunday sometime through Wednesday here, but it looks very light, with little wind. We will be fishing. A friend asked me the other day if a bright sky would slow down the fishing. I told him about all of the great fish that we have caught in the noon day sun, in shallow water or on the surface, in the middle of the summer. He had that vague look of someone who was politely doubting what his guide had to say. A little while later, by around 9 a.m., we caught one of the biggest sea run Cutthroat that I have ever seen, well over 24 inches, just beneath the surface, maybe fifty feet from shore. To put this in context: I have spent thousands of days on the water here over the last 13 years, and I have only caught or seen a few fish over 19 inches. My new experimental baitfish Clouser Minnow seems to be working, as we caught several more fish on it in the next few hours. Things are looking good here right now. Bring your rain jacket! 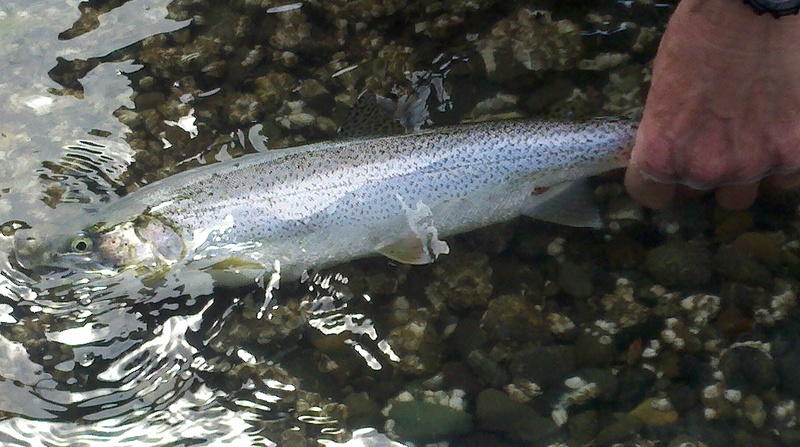 One of Andy's beautiful wild sea run Coastal Cutthroat trout, caught at noon under a bright sun in shallow water. 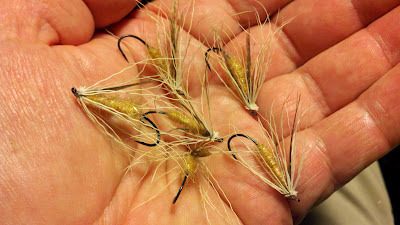 My version of the October Caddis, and these will work very well in saltwater too. Summers end, and A good sign. Even though autumn is still officially a few weeks away, we are already seeing the signs. The pink salmon run will be winding down around here by the end of September, although there are still plenty being caught on our beaches. And the Coho run is just coming on. We catch some pretty nice Coho from these beaches in October too. And we are encountering some of the fattest and meanest sea run Cutthroat of the year now. Not surprising when you consider the kind if water years we have had recently, with milder winters a few years in a row, plenty of snow pack to carry us through the summer, and all of this adds up to more forage as well. The bait and insect life has been plentiful. Around the beaches we are seeing some of the early termite hatches, with more on the way. And for some reason we are seeing more tent caterpillars this year, so we can expect to see those light buttery colored moths on the water pretty soon as well. And the trout love them. I do love dry fly fishing in salt water! Keith caught a nice Pink Salmon on a pink fly! September is looking pretty normal so far as our forecast for the week ahead shows continued on and off cloudy weather, cooling temperatures, light winds and a real chance of rain through the week. The beach fishing should hold together very well no matter how the rivers react. The next week of tides is going to be softer, generally the late afternoon into early evening tides will be the "best" ones, as far as swinging flies for Coho is concerned, and the greater tides resume toward the end of the week. A full moon is coming on. But don't let that stop you today. Get out there at dawn and dusk, and in the low light conditions of the misting cloudy days, and fish with confidence. Especially for cutthroat. I see all of this as the beginning of really good autumn Cutthroat fishing on the beaches, and on the rivers too. This will only get better. It is often very difficult to decide what to do or where to go when there is so much happening all at once out here. The beaches are my preference through October. But then again there are rivers to be fished . . . And if we continue to get these light rains and reviving river flows, this fall could shape up to be a good one indeed. I guess we'll just have to go fishing to find out! We'll be walk and wade fishing these beautiful Olympic Peninsula saltwater beaches right through autumn, with September and October offering us some of the best guided fishing opportunities of the year. If you would like to plan a fishing date with me- do it well ahead of time! Remember: Catch & Release, Fly fishing Only! It's supposed to be fun . . .